This advert from 1963, sent by IDJ, confirms that expansion. And outlines the company’s interests in importing, contracting, exporting and manufacturing. a) Hong Kong Knitters – ‘Easeley’ cotton and woollen knitted shirts, combed cotton underwear. b) Hong Kong Weavers Ltd – bras, raincoats and carcoats. I vaguely remember the latter in the UK – see wikipedia below. c) Fortuna Garments Ltd – dresses and pyjamas. I haven’t heard of this company. Was its manufacturing based in HK? The company was founded on 15 July 1955, and still exists as a part of YGM. A Chinese name was added in the Hong Kong companies register at the end of 1971, “香港織造有限公司”. 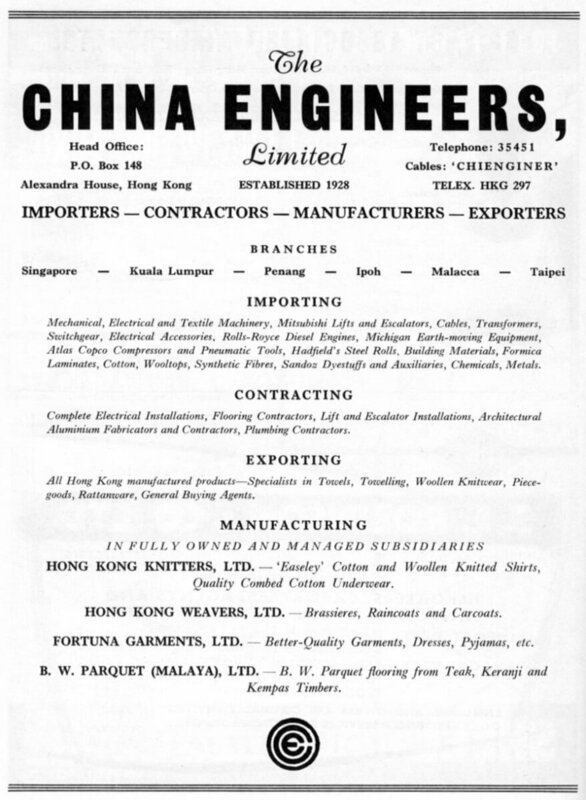 The only mentions I can find of Hong Kong Weavers Ltd. are that they were headquartered at Alexandra House. Fortuna Garments Ltd. was founded on 28-05-1959, and struck off the register of companies on 31-08-2012. From founding until 08-02-1972, their Chinese company name was “福川製衣有限公司”, and subsequently it changed to “福銓製衣有限公司”. By the 1970s, Fortuna was located at Tin’s Third House, 777, Lai Chi Kok Road, 10th & 11th Floors, Kowloon. As of the late 1980s and 1990s, Fortuna was at 8/F., Wong Chan Kee Commercial Building, 12-14 Ka Hing Road, Kwai Chung, New Territories, Hong Kong, and produced jackets and jeans.